When a workplace is designed to be a hub of inspiration, connection, creativity and energy, there’s no doubt that innovation will follow. It’s no secret that the workplace today is evolving into a very different environment from that of the past. Today’s office is no longer just a desk or cubicle, but an actual space that blends the continuum of experiences that make up home, work, and play—and community. As a result, companies are exploring opportunities to build community within their organizations, as well as welcome and engage with those outside their own walls. When these organic-by-design connections happen, the workplace itself becomes a ‘community hub.’ It’s no longer simply a company or a place to work; it becomes integrated into the lifestyle of employees, clients and many others. As a result, it knits everyone together, and that’s a win-win for the employees, the company and the community. But what’s driving this, and how will it change today’s work environment? Here’s what it means and how it will change the workplace of today. Defined as a public place that brings various related communities together, there are several reasons why today’s workplaces are considering community in their design. In part, it can be seen as a reversal of the un-tethering movement which allowed autonomy but left many people feeling disconnected. Also, the pendulum has swung back to recognizing that the benefits of daily interaction outweigh the benefits of working alone. In addition, while people need solitude to focus, they also nee –and seek out–new opportunities to engage rather than isolate. This togetherness inspires unexpected opportunities, new ideas and fresh perspectives – all of which support creativity and innovation. Another reason the workplace as a community focal point makes sense is the changing workforce’s need for not just balancing but merging work and life. The up and coming employee no longer simply goes to work, does a job, and then goes home. Today’s workers need their workplaces to holistically reflect experiences they feel are important, as well as mirror their own need for daily inspiration in the one place they spend a great deal of their time. Nowhere is this more evident than in HGA’s Euclid Gallery, in Santa Monica, CA. Named for the street on which the firm is located, it was specifically designed to inspire and engage employees while offering a showcase for artists across a wide range of practices. When the firm looked to relocate its Los Angeles office, they were provided the perfect opportunity to demonstrate their commitment to the “art of design.” With the Santa Monica location, the space reflects, and fully brings to life, the firm’s vision for designing their own community hub, while seamlessly incorporating the current evolution within the workplace. Thus, this space is not only a place of community for the people who work here; it is also a community space for many others as well. With its high ceilings and clean design, this loft-like gallery sets the tone for the space and welcomes the curious, just as an art gallery encourages visitors and invites exploration. The gallery’s grand lobby area provides an opportunity for various groups such as local non-profits, art groups, or area businesses, to engage with HGA’s community. It also builds stronger community partnerships through hosted gatherings, dinners, art installations, lectures, and even yoga classes. As a space that was purposefully designed to become a community hub and host public and private events, the Euclid Gallery naturally encourages socializing. Because it isn’t overly branded, it serves as a neutral platform for embracing different interactive experiences, which makes the artifacts, people, and activities within the space the focus. Since the firm moved in about a year ago, the Euclid Gallery has already hosted an art film night, “Women in Architecture” events, lunches, lectures, yoga classes and even a bonsai tree-trimming seminar. The space also boasts an integrated large overhead projection screen, which, when the screen is not in use, serves as a gallery wall. Hubs today often feature various amenities like café-style areas, areas for breaks with comfy seating reminiscent of a living room, conversation stations where laptops and seated cushions are the norm, and even game rooms. Appealing to both the introvert and extrovert, these spaces create natural opportunities for social interaction which spark new ideas and a refresh for the brain. Sometimes located near entryways or lobbies, these warm community settings convey the specific company personality, creating an immediate, almost palpable energy within the workplace for employees and visitors. A workplace community hub acts as a destination–one that is located in a central space, creating a “go-to” place which all employees have access to and utilize as the need for inspiration strikes. This type of hub serves all employees and their preferred work style, providing an additional choice about where to perform their daily tasks. In warm weather areas such as California, outdoor spaces become natural community hubs that encourage impromptu gatherings and innovative conversations. In other areas, where the high cost of real estate means spaces are tight, locating these hubs, cafés or smart designs adjacent to outdoor areas help bring greenery and natural light in, creating a sense of wellness. Emphasizing community hubs within the workplace also helps build a healthy company culture. It allows a company to reinforce the company values and demonstrate to employees that the company itself is dedicated to the communities that they touch – both within and without. These spaces can be used for anything from film screenings to art exhibits to company parties and give additional meaning and value to the work that people do every day. 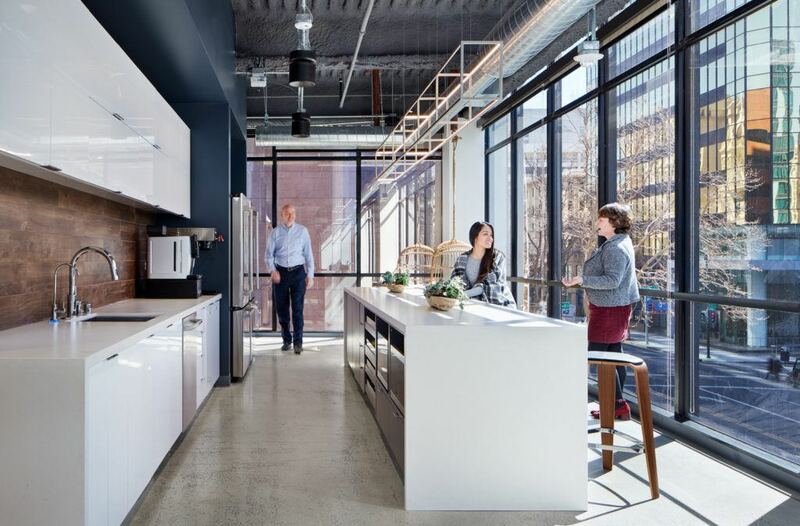 When HGA designed their offices, the need to build community within the office and connect with the next generation of designers was vital. Creating spaces where people can take a break, have coffee, look at art, or communicate with others around them invites camaraderie and creativity, creating strong bonds between the team members. At the end of the day, an office should be designed to inspire–a space that a person can look forward to going to everyday, where a person knows their best work will be produced. When a workplace is designed to be a hub of inspiration, connection, creativity and energy, there’s no doubt that innovation will follow. Read the full article in Work Design Magazine.